Trailer for upcoming Japanese anime film "Night is Short, Walk on Girl"
Gracefully yet violently, The Girl with Black Hair swirls through the abstract Kyoto night a joyful tempest. Blowing through pub crawls, festivals and book fairs, her youthful glee infects parties of increasingly eccentric characters, but amongst the debtors, existentialists and the God of the Old Book Market, can she be convinced “coincidental” encounters are fate and will she notice the Senpai in pursuit of her love? Whether the hands on your clock move fast or slow, Night is Short, Walk On Girl. 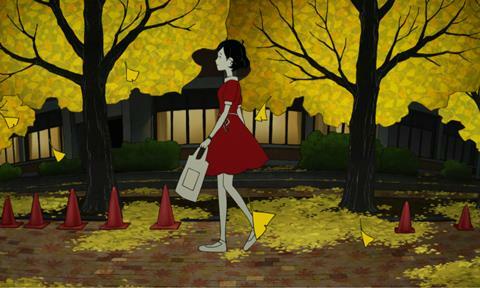 "Night is Short, Walk on Girl" is directed by Masaaki Yuasa (best known for TV projects like Kaiba, The Tatami Galaxy and Ping Pong) and based on a novel by Tomohiko Mori. Asian Film Vault: Trailer for upcoming Japanese anime film "Night is Short, Walk on Girl"